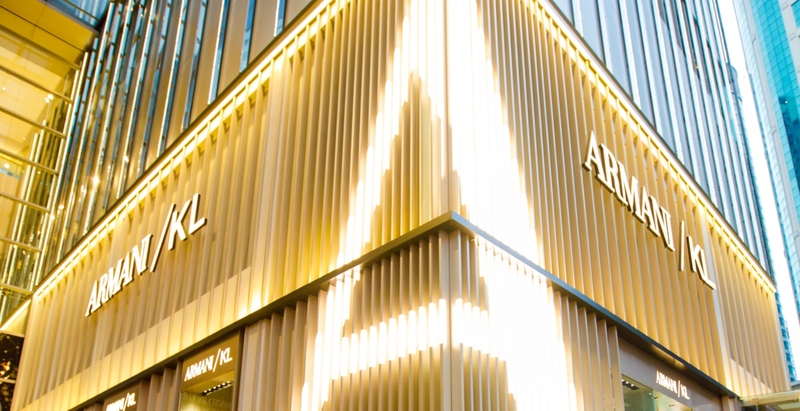 Pavilion Kuala Lumpur ushered in an exciting new addition last week with the opening of a beautiful Armani/KL space designed by Giorgio Armani’s team of in-house architects. Natural light serves as a focal point for the impressive store, the bronze metal slats part of the facade allows customers a peek inside while a mammoth ‘A’ initial glows brightly on the corner, perfectly exuding the luxury and exclusivity well-known to Armani. To commemorate such an arresting new retail space, the night accompanied a special presentation of the Autumn/Winter 2018 collections for both Giorgio Armani and Emporio Armani. The event was aptly topped off with a star-studded audience: Fala Chen, Debbie Goh, Jane Chuck, Joe Flizzow, Scha Alyahya and Awal Ashaari to just name a few. It is then decided: there is no reason at all as to why you shouldn’t visit the space for yourself. ARMANI/KL store: Lot 2.11 & Lot 3.12, Pavilion Kuala Lumpur, 168, Jalan Bukit Bintang, 55100 Kuala Lumpur.